Exactly one week ago we woke up, wiped the weary out of eyes and nervously made our way towards the orthopedic office to welcome the long awaited newness of a cast free existence. Well, until that cast saw scared the LITERAL pants off of Annie. SHORTS!!! A DIAPER THAT CLOSES!! It has been a long 16 weeks. As timing would have it, I literally left the very next day for Child Life Conference in Cincinnati over the holiday weekend. Leaving my floppy, splayed, Mommy lovin', leggy baby weighed so very hard on my heart. But with Nonnie in town and Kelly working from home... I knew she was in great hands. So. Aside from hanging out in our tiny bathroom for tornado warnings (more of that later), it has been a week of settling in to this new rhythm and celebrating a bunch of GREAT firsts! rolling in both directions and even a little sitting action. Annie will hit those milestones one way or another!! I think that knowing there is always a chance that she could fall out of socket in this window of time before bone ossification, keeps me on edge. Especially because that most likely would mean a new path of femoral or pelvic osteotomy (aka more aggressive surgeries) and another lengthy bout of time in spica. NO.THANK.YOU. I'll learn to deal here soon. Until then, both crazy and normal versions of myself will continue to give daily thanks and stand in awe of the amazing resiliency of my beautiful daughter. My heart has been so changed by this entire process. To all of our family, friends and community *virtual included*, we are so incredibly thankful for your prayers, love and support. It was felt in even our most hardest of moments. What a season of living. There is something so very magical to wake up, look at this person next to you--- who very likely, knowing the person, in minutes will wake up insanely grumpy, completely blind and with crazy dry mouth from a night full of open mouth snoring--- and already feel the laughter in your heart in anticipation of it all. Not all days are like that. Some years... they were even fleeting. I am humbled by the fact that the week of our 10 year anniversary I slept in our guest room because I was too frustrated...too tired... too lots of things to want to work it out before bed. A gentle reality check for my heart. Marriage takes such effort... something that the younger version of my married self would be told and not understand yet. The fact that even in the louder, sleepier, busier times of our lives, that cranky bear of a man, with his wild bed head and silly side eye loves me the most of everyone... even when it doesn't always show on the outside. Given the chance on even our worst of days, I would go and choose him all over again every single time. So I got to think that's something good. 18 years ago, my heart felt something that would take my head years to understand. Some days, I still don't know that I fully do understand. For all my freakish control-seeking ways, it is all those moments of unknowing and surprise that come to mean the most in my heart. I find it so beautiful that what I thought I needed then, is absolutely no reflection of what I can't live without now. It would seem we traded sleep for adventure. Thank goodness. 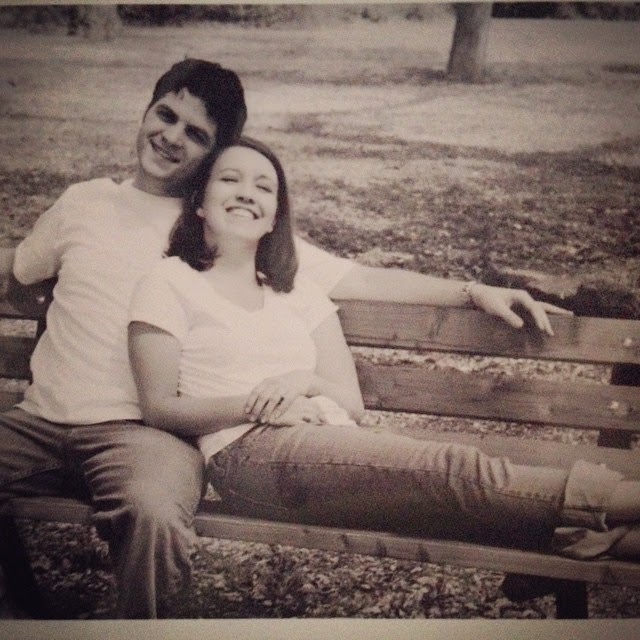 These ten years of marriage... always learning, growing, adding people to our space and crazily all the new somehow manages to melt together to where it feels like there is nowhere else it could have ever been before. Just here in this space. After a few minutes of watching our third youngest run around in balloon blowing delight, it occurred to us that what she was reeeeaaallllyy blowing on was a restaurant staff member's “finger condom” ----or for you non-waited table before folk---the stuff you stick on a bloody, cut up finger. As if to further drive home the point, without missing a beat, Lucy reaches inside her “purple balloon” and spontaneously pulls out the most perfectly bloodied band-aid you ever did see. Kelly dry-heaved and I immediately ordered another frozen margarita stat with a side of Hepatitis C.
It was quality parenting this Mother’s Day. Our lucky children… we can’t even blame this budding negligence on some sort of newbie status. It did, however, lead to quality dinner conversation on the importance of not playing with trash and receiving regularly scheduled vaccinations. Not a great moment added to the parenting win column…and yet, minutes later we were dance partying in the car to a little ZZ Ward (thank you, Margaritas), followed subsequently by sweetly putting a baby to bed and some top of the stairs whispering with my son about my top three most favorite star wars characters (Yoda, an Ewok and R2D2 --- in case you wondering). Suddenly, it would seem that our parenting status was re-balanced and all was right with the world once again. Happy Mother’s Day to all you Mamas out there. You're pretty wonderful… even if your score card may not ALWAYS reflect it at the end of the day. Here's to parenting with a good deal of GRACE. You are officially NINE MONTHS OLD. Hard to believe that you have now been out as long as you were in. We can't imagine our lives without you! You sort of have this entire surgery thing down these days. Patient information? You found no errors there. And you had QUITE the fan club... It felt so fun to celebrate something so very anticipated! Well, except for the day that the raspberries were SUPER tart. We all had a great laugh at your expense. This month you have become QUEEN of all things zerbert. And even had your first visit to the pool. Lucy immediately splashed you in the face which had you in deep laughter. It's going to be a fun summer for sure! Right on target, we started to see a bit of mommy loving attachment on the end of last month. You are very quick to cry when I walk out of the room. I can't believe I was able to document this laugh through tears thing you do when I walk back in the room. Talk about emotional roller coaster. Your crazy will fit right in with the other emotional nuts in this household. It's been a wild ride, Miss Annabel! Can't wait to celebrate all the beautiful bouts of NEW in the month to come!